Zen: Intergalactic Ninja, based on a comic book of the same name, is a story about a militant environmentalist ninja named Zen. He has been assigned by a group a green, pointy-headed aliens to come to earth and stop environmental pollution by any means necessary. Eventually, he will have to find the big polluter, Lord Contaminous. The gameplay consists of side scrolling and isometric 3D scrolling action. Zen can run, jump, slice with this stick, or use powerups as the game requires. One stage has Zen planting time bombs in a toxic factory and attempting to escape within 99 seconds. Standing in his way are roving lasers, security robots, and floating conveyor belts. The second stage takes place in an acid rain-drenched forest. Zen must revive the flowers in the forest with his photon stick while beating off acid rain-spewing floating mechanical devices. The next stage takes place on an off shore oil rig that is going up in flames. Zen must grab fire extinguisher powerups and rescue trapped rig workers while dodging sentient oil slicks and raining fireballs. Another stage is called the High Speed Railway stage. The goal is to stop the garbagemen spreading nuclear waste. 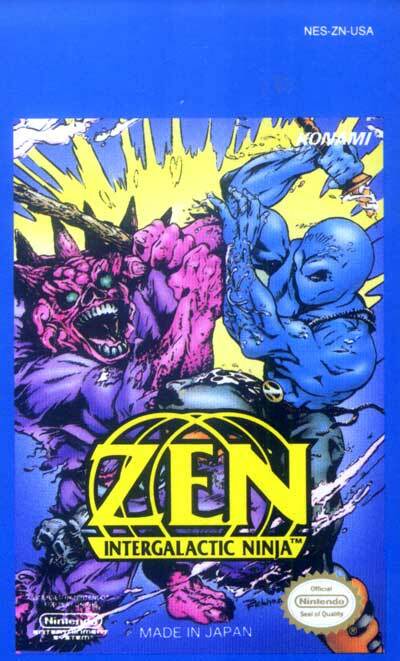 Zen is in a mining cart racing underground and fighting other enemies in carts. Zen can make this cart jump, which we will have to do often in order to survive the dangers of the mine.